Note: Not bookable online. Discount applied at check out. an Amsterdam city tour and canal cruise. The beautiful waterways of the Netherlands and Belgium make the Low Countries ideal destinations for river cruising. On this delightful cruise, you’ll experience the real highlights of these two countries, spending time exploring Amsterdam, Antwerp and the charming Belgian city of Bruges. An excursion to Kinderdijk, famous for its many windmills, and a visit to the colourful Keukenhof Gardens complete this memorable springtime voyage. Day 1: UK - Amsterdam. Titan’s VIP door-to-door travel service collects you from home for your journey to Dover, where we take a break before boarding our coaches, for the Channel crossing to Calais and onward journey to Amsterdam. Upon arrival, embark MS Serenade 1 (4T), where light refreshments are available. A welcome cocktail and captain’s gala dinner are served this evening. Day 2: Kinderdijk – Dordrecht. This morning we arrive in the pretty village of Kinderdijk, a UNESCO World Heritage Site renowned for its 18th century windmills, which we visit on our included excursion. These picturesque landmarks have played a crucial role in keeping the area from flooding, as well as more traditional roles for the local trades. This afternoon we sail the short distance to Dordrecht and visit the Royal Delft earthenware factory, where the intricate Delft Blue patterns have been hand painted onto top quality porcelain since the 17th century. Meet the passionate craftspeople during a demonstration and learn about the history of this world-famous brand. There is even the opportunity to purchase examples of their collectable wares. Later this evening we depart for Antwerp. Day 3: Antwerp. You have a full day to explore Antwerp, famous for its Diamond Quarter and tempting chocolate shops. Take a break in one of the many fine cafés and enjoy sights such as the Grote Markt (Great Market Square) and Rubens’ House, where the old master painter once lived and worked, now a museum with period 17th century furnishings and a great collection of his masterpieces, such as ‘Adam and Eve’, on display. Day 4: Ghent. Enjoy a full day at leisure in Ghent, which has a number of interesting museums and galleries worth visiting, as well as some attractive parks and gardens. You may wish to join an optional guided tour to the highlights of this engaging medieval city, including the 12th century Gravensteen (Castle of the Counts) and St Bavo’s Cathedral, home to the Ghent Altarpiece painted by Jan van Eyck in the 1430s and regarded as one of the great masterpieces of the Northern Renaissance. Day 5: Ghent (Bruges). 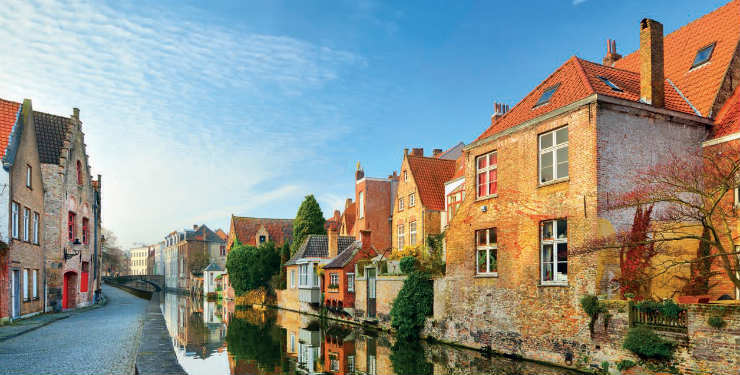 Explore the beautiful city of Bruges, which still displays its heritage from the Middle Ages and the legacies of the centuries that followed, through an abundance of charming canals, stone bridges, and medieval Flemish architecture along cobbled streets. Our included walking tour touches on the highlights and includes a chocolate tasting, before free time allows you to make your own explorations. Day 6: Rotterdam (Keukenhof Gardens). Today we’ll head for Keukenhof Gardens. Planted with millions of tulips, hyacinths, daffodils and more, the gardens burst into colour each spring. Be sure to bring your camera as we walk past rows of rainbow-bright blooms and follow flower-lined paths through woodland and along winding streams. Day 7: Amsterdam. Returning to the characterful Dutch capital this morning, we enjoy an included tour through the city, taking in highlights such as the distinctive tall and narrow merchants’ houses that line the canals, the Magere Brug (Skinny Bridge), central Dam Square and the Royal Palace. A trip along the canals is also included for a different view and further insight into this delightful city. Tonight, enjoy the captain’s farewell gala dinner on board. Day 8: Amsterdam - UK: After breakfast we board our waiting coaches for the return journey to Calais and Channel crossing. Upon arrival in Dover, your Titan vehicle will be waiting for the journey home. VOX portable audio headset system on excursions. all port taxes, duties and surcharges. 2) Offer available on 10 April and 23 April 2019 departures. 3) All prices are £s per person based on two people sharing a D-grade cabin including coach travel to and from MS Serenade 1, and door-to-door transfers to and from your coach. 6) For single rooms (a supplement is applicable, from £150), please call for further details. 8) VIP door-to-door travel service - includes a return chauffeur service from your home to your coach for your onward journey to MS Serenade 1, and vice versa on your return journey. 9) Offer applies to new bookings only. 11) To book please click Claim now. 14) For our full T&Cs, please visit the Titan Travel website.